This isn't James Bond's PPK, but the new PK380 is an economical, incredibly soft-shooting .380. I have a confession to make: I was underwhelmed when I opened the package and took out the new PK380 from Walther. I mean, I was expecting to get my tux cleaned and be posing with the latest PPK. But as I held the gun I was thinking, "This is too big for a mere .380, and where'd the clean lines go?" Then my wife walked into the office and asked "Is that what I signed for?" I handed it over, and she smiled. "Oh, I like the grip." Hmm. My wife is only a shade over five feet tall, and any pistol that fits her hand is one that must be given a second look. She liked the grip shape and feel so much it took a while to get it back from her. Once I did, I packed it up with a gun bag full of ammo and headed to the range to consider the PK380 anew. First of all, it is big compared to other .380s, but it is light. Compared to Bond's PPK, which weighs 23 ounces, the PK380 is only 19 ounces. It is also, unlike a host of other .380s, a locked-breech design. So we have a lightweight, medium-size pistol that has a soft-feeling recoil spring, one that is easy to rack. And that's no small issue. My wife, for example, doesn't have a lot of hand strength, and she simply cannot work the slide on a compact blowback .380. The PK380, however, is easy for her to manipulate, and for her--and many other shooters looking for a defensive handgun--that's a big plus. 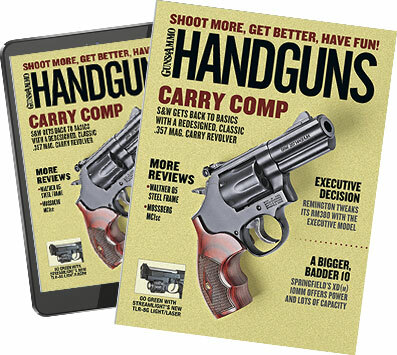 Those using it as their main defensive handgun--or even as a backup pistol--will be pleased to see the magazine holds eight rounds, two more than other .380s. The magazine goes into a polymer frame with a grip that my wife can handle and yet is comfortable for me to hold on to. I don't have huge meat hooks (I'm more the slender surgeon's or pianist's hands type), but small guns can be troublesome for me. The PK380 fits us both, which means it will likely fit a whole lot of other shooters' hands as well. A big part of that comfort are the sculpted recesses behind the trigger on each side of the frame. In overall appearance, the Walther PK380 looks just like a scaled-down Smith & Wesson SW990. The swoopy frame is mated to a squarish, angle-sided slide, giving it a non-nonsense look. The recesses behind the trigger are a big part of what makes the PK380 so comfy to shoot. The paddle at the rear of the trigger guard serves as the mag release. The sights are comprised of a sharply angled ramped front and a rear blade. They're the obligatory three-dot sights that have been all the rage since the mid-1980s and are surprisingly large for what one might consider a pocket pistol. However, bigger means easier to aim, and aiming is a good habit to encourage. The magazine release is the Walther design: an ambidextrous paddle that rides at the rear of the trigger guard. I've found that the best way to work it is not with a thumb but with the trigger finger. There are two recessed levers inside the frame, one on each side forward of the trigger. The one on the right is the trigger lock. Use the provided tool to rotate the lever to lock or unlock. The indicator is clear and obvious, marked "F" and "S" for fire and safe: If the bar runs parallel to the bore, you can fire; if it is crossways to the bore, no fire. The integral trigger lock requires a tool to engage or disengage; the same tool is used for disassembly. In other words, don't lose the tool. The bar on the other side is the disassembly bar. The process is simple. Unload the pistol (check it twice), then close the slide. Insert the special tool provided (it works on both the lock and the takedown) and turn the internal bar 135 degrees counterclockwise. Then pull down the locking block and remove the slide and barrel assembly from the frame. Now, I'm all for trick and high-tech engineering, but I have to wonder about this. I have spent enough time working in gun shops to imagine how quickly this tool will get lost. And if you lose the tool and need to lock or unlock the pistol, or disassemble it, what's going to happen? I can imagine gun shops faced with PK380s featuring gouged frames at the takedown and lock holes, where not only did your cousin Merle get to it with needle-nose pliers but didn't bother to get the really narrow ones. If you decide to get a PK380, inquire about a spare takedown tool. Those reservations aside, the design is a compact way to put a secure disassembly method into the frame and incorporate an integral lock as well, which some states do or will mandate. As a further bonus for those planning on using it as their main gun, the PK380 comes with an accessory rail for a light, laser or combo unit. The PK380 is slim. At its widest, across the ambidextrous safety levers, it is only 1.20 inches thick. Elsewhere, it is a mere .85 inch thick. The rear of the barrel is cleared from the ejection port, around the extractor, to act as a loaded chamber indicator. Look in. See brass? Loaded. No brass? Not loaded. The trigger is a traditional double action/single action. You can stroke through the trigger on the first shot and then have a shorter, lighter pull on subsequent shots. The trigger isn't what is different on this new Walther; the safety is. The safety--an ambidextrous lever on the rear sides of the slide--is not a decocking safety. What would a pistol today be without an accessory rail? Walther does not disappoint in this regard. down (safe) position and leave the hammer cocked. Before you fire the gun, you'll have to remember or have trained yourself to push the safety up to the fire (horizontal) position. Or, having chambered a round, you can push the safety to the safe (down) position and then carefully lower the hammer. Once the hammer's down, you can then push the safety up to the fire position, and when you need your PK380, simply stroke through the double-action trigger pull. My thumb does not meet the safety bar when the bar is down, so for me the best way to address this would be to engage the safety, lower the hammer, then disengage the safety. But I'd be extra, extra careful when lowering the hammer because if I'm tired, distracted or otherwise not up to speed, it's possible I could forget to engage the safety before proceeding. If my fingers are cold, wet or cramped, I don't want a compilation of mistakes on my part to lead to a TV with a hole in it. Then again, for a new shooter, learning any safety mechanism is a new thing. It is only us old-timers who grumble about changes, old-timers who find our sensibilities put out of joint by this new approach--although it's worth noting that this is same type of safety found on Walther's P22 rimfire pistol. The author wasn't enamored of the safety design, which blocks the firing pin but doesn't decock the hammer. So we have a big-enough, lightweight-enough .380 pistol that has increased magazine capacity and a safety mechanism that us old-timers will have to get used to. How does it shoot? Well, for a pre-production gun, not too bad. At press time there were exactly two PK380s on this side of the Atlantic. One went to Mustafa Bilal, who did the cover photograph and the lead photo for this article, and the other went to me for range abuse. I took a selection of current premium ammo to the range, as well as a bucket of what I call "commodity" ammo--plain Jane lead roundnose and jacketed roundnose reloads I use for volume shooting. On the first shot with the PK380, I stopped, removed the magazine and checked the chamber. Then I checked the bore. The recoil was so soft I wasn't sure the pistol had actually cycled. Perhaps the bullet was stuck. Nope, there was clearly daylight down the bore. So I loaded up again and watched the backstop. Sure enough, at the sound of the shot, a puff of dust appeared where I was aiming. Soft recoil does not begin to describe the PK380. With regular .380 ammo and even the current premium loads, it shoots so softly you might just think you're firing a .22 Long Rifle. A 90-grain bullet at a little faster than 900 fps is no big deal. If you want someone who is recoil-shy to have a reasonably effective defensive pistol, this is the one. I had none of Cor-Bon's .380 ammo along, and I'm sure out of the PK380 barrel its ammo would be delivering all of the advertised 1,050 fps. I'm also sure it would not be any big deal to shoot, unlike the usual labor of robust Cor-Bon recoil out of a compact .380. I proceeded to do my chronographing and then spent altogether too much time having fun plinking at the hill before I got back to work. If you plan to use the PK380 for defense or want to teach someone to use it for defense, find some inexpensive .380 ammo and have some fun, because this pistol will deliver it. And your student will not be driven off by recoil. However, no fun goes unpunished. Soon after I settled down to do my accuracy work, disaster struck. I managed to shoot a couple of groups, enough to determine that the accuracy I was seeing while plinking was not an illusion. My 25-yard groups with Hornady FTX 90-grain ammo averaged 3.0 inches. Then the PK380 stopped firing. It wouldn't close, and I couldn't get it apart. I called the factory and got permission to whack it apart with a rawhide mallet (trained professional, closed course, do not attempt). What I found is that the rear of the recoil spring (in the finest German fashion, a multi-strand, braided affair that will probably never wear out) had slipped over the end of the guide rod. The tip had wedged against the bottom lug of the barrel and kept the slide from closing. The barrel is relieved at the rear by the extractor, the setup serving as a loaded-chamber indicator. I've told S&W--sole importer of Walther firearms--about this, and I'm sure the Walther people will take care the issue. Lest you think this is a problem with the PK380, it isn't. It is exactly why the gun makers let guys like me shoot (and break) their pre-production prototypes. Me, I'm not worried. Once I bent the end of the spring back into shape, the little PK380 cranked along just fine--although, unfortunately, by the time I got this all worked out I had to turn in the story and never got to finish the rest of my accuracy testing. Again, I'm not concerned. My biggest fear now is, if I ever get a production gun and my wife gets the chance to shoot it, I'll be out a couple hundred bucks. Actually, come to think of it, that's not such a bad thing.